How to do paging in DetailsView control in ASP.Net C#. 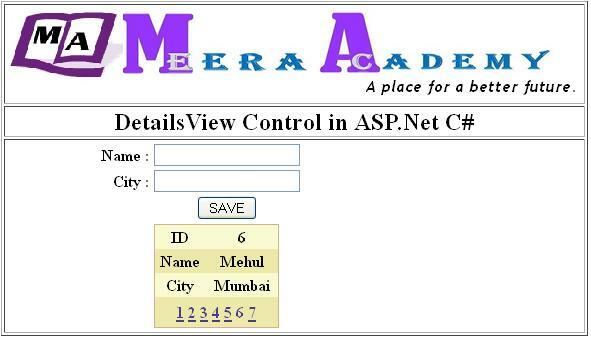 We have already learned to bind and display record to DetailsView control in ASP.Net. In this post we will learn to do paging in DetailsView control in ASP.Net. Now bind the data to DetailsView control by clicking the Save Button. Now, we have to write code at PageIndexChanging Event of DetailsView in ASP.Net. write below code at PageIndexChanging Event of DetailsView for show next record in DetailsView control. Hope this ASP.Net DetailsView paging Example will help you……. ← How to use DetailsView control in asp.net C#.